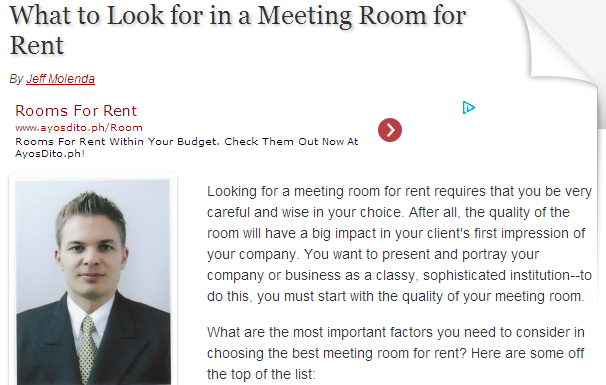 Some companies find the need to rent a meeting room for a number of reasons. Size may be one factor, or location. A meeting room is rented usually for the convenience of people who are called to participate. These office rooms are often equipped with amenities and technology features that a regular office wouldn't have. How the room looks is what your clients and partners will see upon entering the meeting room. Make sure they see an area that is professionally designed and decorated in a way that will give a positive image to your company. The room doesn't have to be very sophisticated or expensive-looking--just a clean, professional, and inviting meeting room is enough to give off the right vibe to your clients and partners. This strikes as one of the main benefits of renting meeting rooms in Washington, DC. Most times among participants, location becomes an issue. Organizers rent other places to meet because such a place is accessible to everyone. A quiet, well-equipped room is a better option than meeting in a crowded place like a restaurant. Most of the time an on-site conference room cannot accommodate a large number of attendees. By renting a meeting room that meets the size of the audience and the purpose, organizers give everyone a breathing space to move about and think. Renting a meeting room from companies such as Metro Offices that offer workspace solutions for businesses, including top amenities for their own use, such as a business lounge and high-speed Internet, can help business owners focus on more creative issues to improve their business. Ultimately, when you rely on people or other outside firms because they can do things better, or have figured things out more ingeniously than you ever can, life turns out simpler and smoother and more productive for you and your goals. Whether you're a small company or a large one, finding a meeting room in the right location will not only save you time and money, but will also help eliminate a great deal of stress you can surely do without.